Who would think that something as simple as texting would be a dangerous tech habit? Or uploading a photo? It may be a bit on the overly cautious side, but it’s true. The relative ease with which we can make our daily life public is great. Thirty years ago we were still relying on long-distance phone calls and snail mail to keep in contact with friends and family, but now we’ve got gadgets and gizmos galore to help us out. Video conferencing, cell phone family plans, and photo sharing sites keep us in constant contact. Traditional long distance phone calls are becoming more a thing of the past and Internet-enabled devices are giving us more ways to connect. The only down side is that no one is teaching us how to use these things safely. How do we know how far we should go? How much is too much? How can we keep our private information private while still exploring the web? These are questions you usually have to answer yourself. But we’ve come up with some quick tips on things to look out for when you’re out there. I almost feel silly writing this, but the fact is that plenty of people still haven’t figured out that texting while driving is crazy-dangerous. 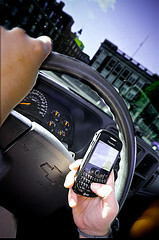 It’s so dangerous, in fact, that many cities are outlawing texting while driving. Pull over or wait until you are parked to send or read a message and keep yourself (and the others around you) safe while on the road. It happens to the best of us, but this is particularly important if you like keeping your PC virus-free. Don’t open emails from anyone you don’t know, and only open/save/view files from friends when you know you’re expecting something. Foursquare sure is fun, especially when you’re mayor of a location or you get a new badge. So is geotagging your pictures and putting them on Flickr for grandma to see. But be careful when you’re doing these things because if you have geotagging enabled, anyone who has access to your geo-aware services or websites may be able to see the location of your home, school, or office. That may be fine if you only allow friends and family access, but if you leave it open for everyone you may be giving more details than you mean to do. And the last thing you want is an unwelcome visitor coming over. If you aren’t backing up your important files (taxes, family photos, legal documents, etc.) then you’re asking for trouble. DVD burners and external hard drives are pretty reasonably priced, so there’s no real excuse for it unless you like the danger of flirting with disaster. If you haven’t read our post “12 Tips for Making a Good Password.“, do it now. I’ll wait. Did you read it? Good. Now go change all of your passwords. I do agree with this post. Sometimes it really became very dangerous.It can be harmful for life also.